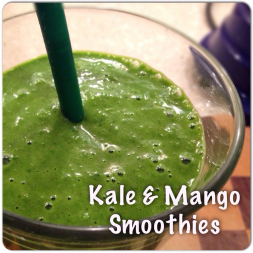 This recipe is adapted from Womanista Wellness (formerly SkinnyMom), which can be found here. Jon and I have been menu planning for a few weeks now, and it’s been helping us stay on track like nobody’s business. 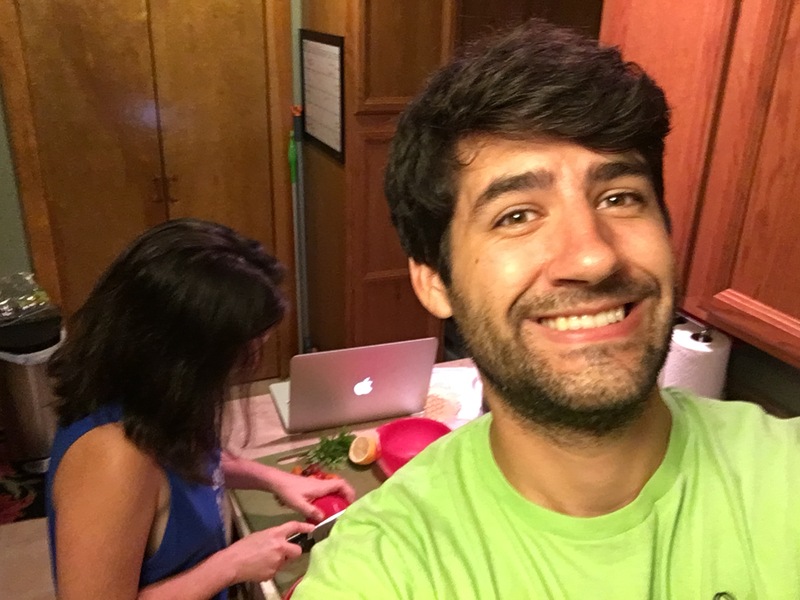 We’ve packed lunches very consistently, eaten out less, and spent more time together in the kitchen. And we’re learning all the words to the Waitress soundtrack and Kesha’s new songs. 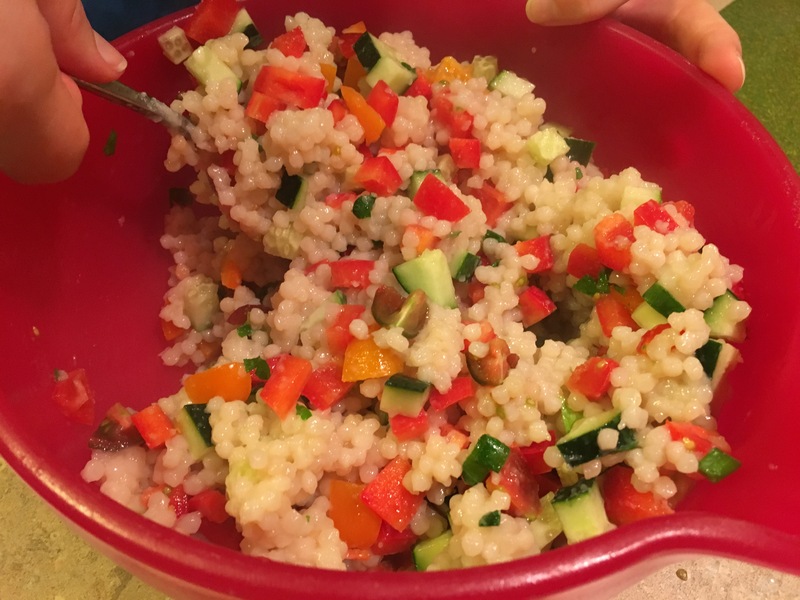 One of our favorite recipes that we can make in bulk and use as a dinner meal and then for lunches for a couple of days is Israeli couscous salad. 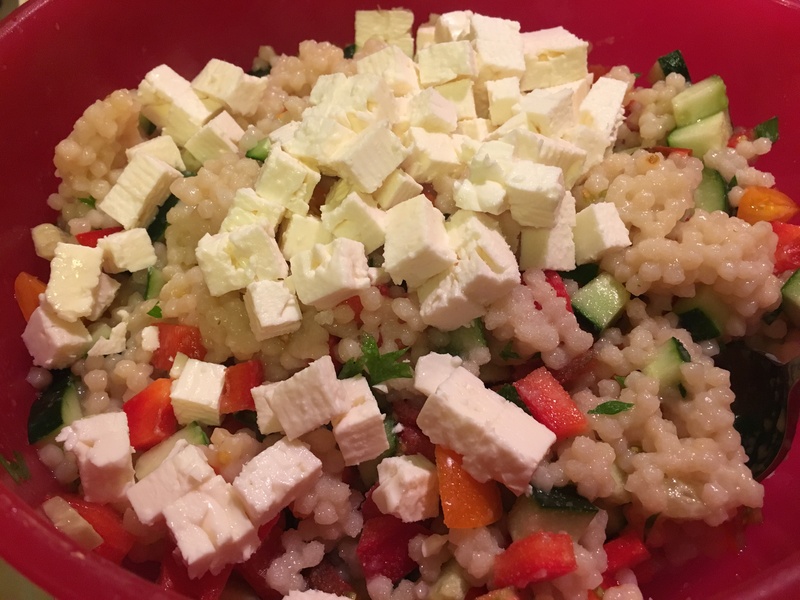 It’s super simple; basically you just chop some veggies and feta, cook some couscous, and mix it together. 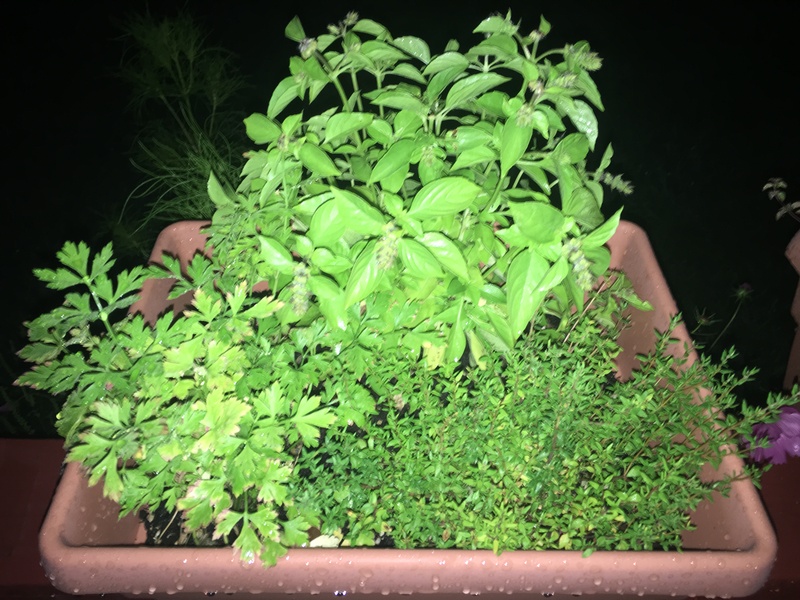 We start by harvesting some parsley from our herb garden on the deck. Then we make it rain couscous, which felt appropriate given the torrential downpour(s) we had today. This boiled pretty quickly for us, so mind your pasta to ensure it doesn’t boil over. This is what he did after I kicked him off chopping duty. So handsome! The original recipe halves the tomatoes, but I like the cucumber, pepper, and tomatoes to be around the same size, so I dice everything. 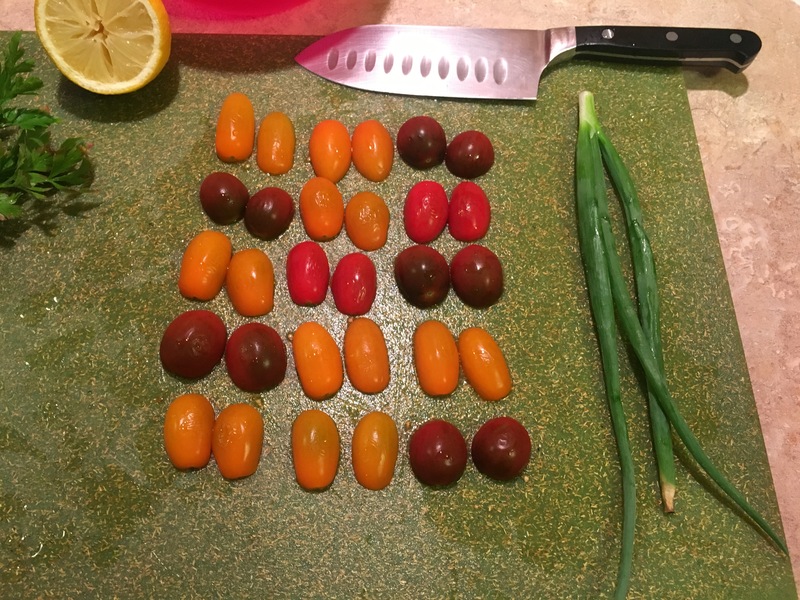 And the little maters look so nice all lined up, ready for slicing. The original recipe doesn’t use a pepper, but we love adding extra veggies wherever we can, so one day we just decided to make it that way and the rest is history. Everything’s diced and looking nice! 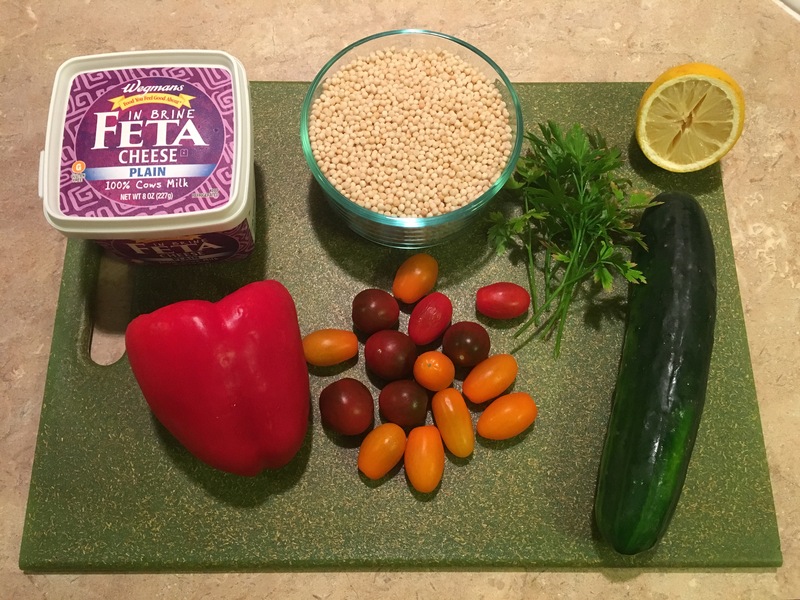 We add the lemon juice and, once the couscous is cooked and cooled a bit, we add the couscous to the bowl of veggies and stir! Feta goes last, along with salt and pepper to taste. I could probably eat all that feta just as is. Pop them cubes like popcorn. After serving up a bowl for Jon, we portioned out the remaining salad for our lunches. Every time we make this, I get pretty excited to eat it the next day. And the one after that. I’m a simple person. The nice thing is that you can heat this up, enjoy it cold, or eat it lukewarm if you’re too impatient to wait for the break-room microwave (speaking from experience). 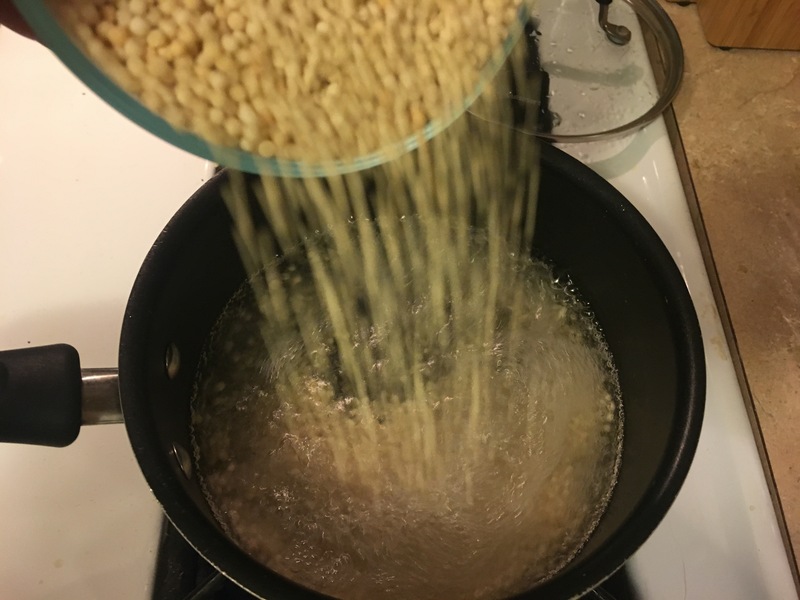 I hope you enjoy this recipe . . . or at least the cute photo of Jon! A super simple side salad (though we often eat it for a main course) featuring some fresh veggies and garden herbs. Cook Israeli couscous per package instructions. 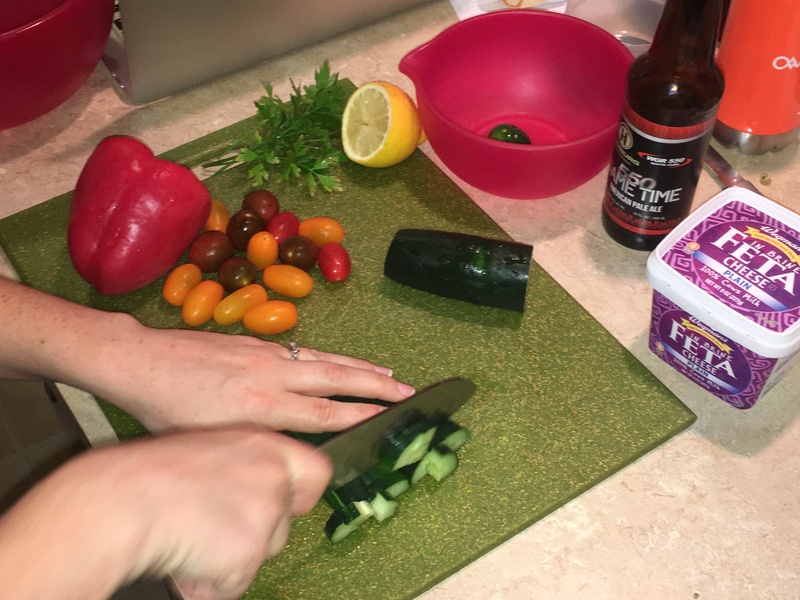 While couscous is cooking, dice red pepper, cucumber, tomatoes, and green onion. In a large bowl, combine veggies with lemon juice and finely chopped parsley; set aside. Cube the feta, using about half the block or container; set aside. Once couscous is cooked and all water has been absorbed (should be light and fluffy when running a fork through it), let it sit to cool for a few minutes. Then add the couscous to the large bowl with the veggies. Add cubed feta last to avoid melting, as the cheese tends to get a little rubbery if added too early. Then add salt and pepper to taste. 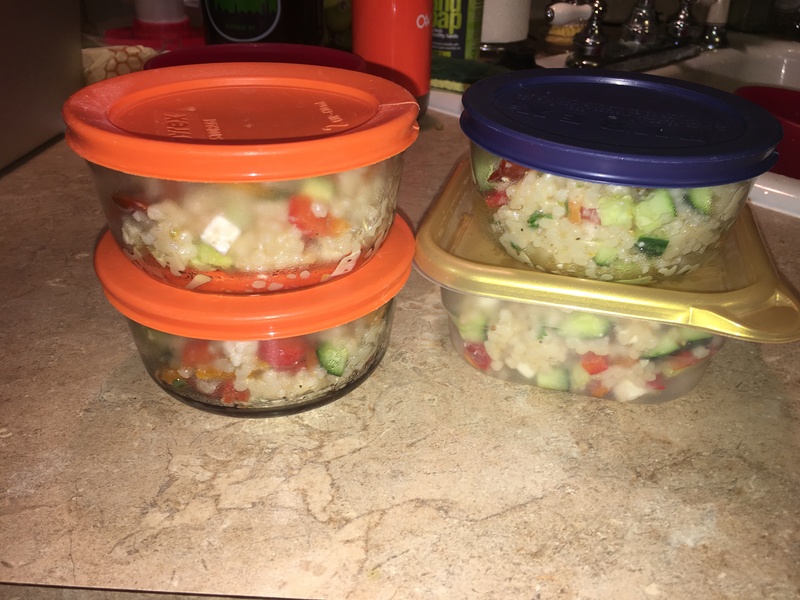 Note: Before adding the feta, salt, and pepper, You can place the couscous-veggie mix in the fridge until cool for a cold version of the salad. It tastes great either way. Thanks! I hoovered it for lunch. It was glorious.